ClamWin Free Antivirus is a free antivirus for Windows. It provides a graphical user interface to the Clam AntiVirus engine. Why does ClamSentinel give so many false positives? Its going off ALL the time,and I know I have no infections. It seems to go off for everything I download, the partially downloaded file gives a warning and I hate that. Those constant warnings make ClamSentinel completely unusable in my opinion. Yeah , I agree , many antivirus bring down pc performances , this one combined with ClamSentinel keeps light background processes consumption . This is my only antivirus the last 2 months in my 3 PCs. I combine it with ClamSentinel for real time scanning. No infections till now and my PCs have become much quicker. For ClamAV WITH a real-time monitor get ClamAV for Windows. Using in-the-cloud technology PLUS ClamAV's adequate (NOT great) database of malware sigs PLUS community cross-feeds, ClamAV for Windows offers excellent protection. Feather-light (because it's in-the-cloud), stable, stringently maintained -- I recommend you give it a try. -1 for not having real-time protection. But only -1. Remember, that viruses don't just pop up from nowhere, they come through various directions called "attack vectors". ClamWin IS capable of countering them even without real-time protection. It WILL scan files Firefox downloads. It WILL scan e-mails you get in Thunderbird. It CAN BE integrated into most applications that acquire files for you (browsers, e-mail clients, p2p clients, ftp clients etc). It WILL NOT protect you if some piece of buggy software on your PC is vulnerable and downloads-and-executes malicious files. It WILL NOT protect your if some piece of buggy software on your PC is vulnerable to buffer overflows and executes malicious code at remote attacker's whim (and no AV software will protect you from that kind of attack, by the way). It WILL NOT protect you from your own stupidity (such as having AutoRun enabled for external storage devices). Without RT protection this software is made for smart people. Not for dummies, who think that running some magical application will make them safe. P.S. ClamWin is a port of Clam to Windows (and GNU/Linux version of Clam is much more capable). Therefore slandering Clam in particular and free security software in general is something only a fool would do. I'm with Hilbert and JackRegan on this one. ONE star until Real Time Protection is developed and implemented. At that point it will actually be worth a proper evaluation against other products. The average user IS a dummy. "oh I like that " Click. Like. INFECT. "Oh that looks neat" Download. INFECT. "Oh that site looks cool" Click. INFECTION BY DRIVE-BY. "Oh this product isn't for dumb users". Click. "OH, I'm a SERIOUS dummy for even thinking that stupidity in today's user environment". 2. Fooling the gullible into believing that they've actually AV software running when they've not. ...And ClamWin performs these exceptions with flying colors. Knockers on a bull would have more use (at least they'd have novelty value). At last i can agree with roj about something. Perfect for people who don't feel threatened by the big bad internet. I love it cuase it never runs, never finds anything when it does, and I never get virus's to begin with, Go figure. Only idiots post just to say they don't use it as if they were not already aware of how it works. Both of your reviews are like used TP. WGAF morons. Roj, nobody gaf what you think about name schemes or anything else jagoff, You don't even use it. Jack must be your boyfriend no doubt. You should probably tell the creator of hiren's boot cd that he should rename the av software on it too just for you. This product needs to be renamed. It is NOT an antivirus. 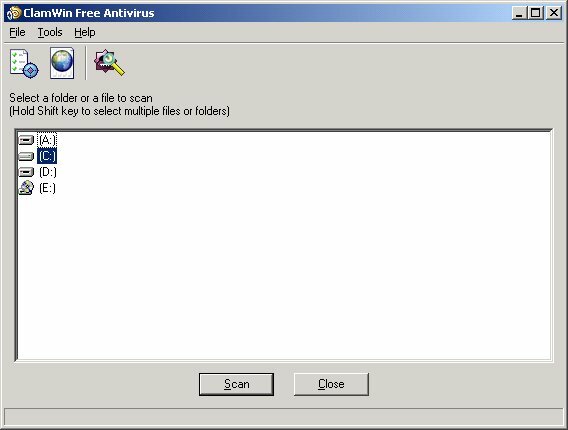 An antivirus PREVENTS infection and to that end has as a key feature something called Real Time Scanning. This software is incapable of real time scanning. It attempts to shut the stable door after the horse has already bolted and as with all such designs, fails - you'll already be infected. It is at best a malware removal tool or passive scanner. Even as an anti-malware removal tool it remains second rate. MalwareBytes chews it and spits out the bones. In short, I really can't see a use for this other than as a backup for something like MalwareBytes. Run Microsoft Security Essentials - you'll be FAR better off. It's not about being threatened by the big bad internet. It's about prudence, intelligence and foresight. Based on your comments you're an epic fail on all of the above. Why would you use this second rate antivirus? Scanning an individual file is soooo slooooow! Avast Free has an option during install called "custom installation" in that you can unselect all "shields" and then install it. Now you have a world class on demand antivirus that scans quickly and has a HELL of ALOT better detection rate!